A U.S. Customs and Border Protection officer walks along a wall at the border between Mexico and the United States, as seen from San Diego, California, Nov. 25, 2018. U.S. authorities have reopened the San Ysidro border point of entry between San Diego and Tijuana, Mexico, after closing traffic in both directions in response to migrants trying to rush the border Sunday. About 500 men, women and children overwhelmed Mexican police blockades, prompting U.S. agents to fire tear gas as U.S. Border Patrol helicopters flew overhead. The Department of Homeland Security Secretary Kirstjen Nielsen said in a statement that the port of entry was closed "to ensure public safety in response to large numbers of migrants seeking to enter the U.S. illegally." Mexico's Interior Ministry said in a statement that authorities were able to contain the group that "in a violent manner" tried to cross the border, and that those who are identified as participating would be immediately deported. 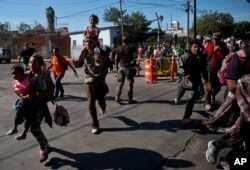 Migrants break past a line of police as they run toward the Chaparral border crossing in Tijuana, Mexico, Nov. 25, 2018, near the San Ysidro entry point into the U.S.
​About 5,000 Central American migrants, many of them attempting to escape poverty and violence in their homelands, have arrived in recent days to Tijuana, just south of the western U.S. state of California, after making their way through Mexico via a caravan. Earlier Sunday, U.S. President Donald Trump implored Mexico and Central American countries to halt the stream of migrants heading to the United States, even as Mexico denied his claim it was willing to allow U.S. asylum-seekers to stay there until their cases were decided by American immigration courts. "Would be very SMART," Trump said on Twitter, "if Mexico would stop the Caravans long before they get to our Southern Border, or if originating countries would not let them form (it is a way they get certain people out of their country and dump in U.S. No longer)." He claimed opposition Democrats "created this problem. No crossings!" Trump said late Saturday that migrants at the southern U.S. border - most of them from Honduras, Guatemala and El Salvador - "will not be allowed into the United States until their claims are individually approved in court. We only will allow those who come into our Country legally. Other than that our very strong policy is Catch and Detain. No 'Releasing' into the U.S."
He added, "All will stay in Mexico. If for any reason it becomes necessary, we will CLOSE our Southern Border. There is no way that the United States will, after decades of abuse, put up with this costly and dangerous situation anymore!" ​But Mexico's incoming government, which assumes power next Saturday, denied that it is willing to let U.S. asylum-seekers stay there pending the outcome of their cases in U.S. immigration courts, which could take years. "There is no agreement of any sort between the incoming Mexican government and the U.S. government,'' future Interior Minister Olga Sanchez said in a statement. She ruled out that Mexico would become a "safe third country" for the migrants trying to reach the U.S. Hours earlier, however, The Washington Post quoted her as saying that the incoming administration of Andres Manuel Lopez Obrador had agreed to allow migrants to stay in Mexico as a "short-term solution," a plan dubbed "Remain in Mexico." Migrants run toward the U.S. after breaking past a line of Mexican police at the Chaparral border crossing in Tijuana, Mexico, Nov. 25, 2018, near the San Ysidro, California, entry point. ​The White House said, "President Trump has developed a strong relationship with the incoming (Lopez) Obrador Administration, and we look forward to working with them on a wide range of issues." During the campaign for U.S. congressional elections in early November, Trump decried what he claimed was an "invasion" of immigrants trekking through Mexico toward the United States and dispatched several thousand U.S. troops to the border to block their path. 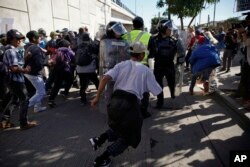 Tijuana Mayor Juan Manuel Gastelum on Friday declared a humanitarian crisis in his border city, which is struggling to accommodate the migrants. Most of the migrants are being housed at a sports complex, where they face long wait times for food and bathrooms. Trump ordered that immigrants who entered the U.S. illegally, other than through a normal port of entry, would be ineligible for asylum. But a U.S. judge temporarily suspended the order, a decision attacked by Trump.